The National minimum wage rate is currently £8.21 for workers over 25 (from April 2019). The minimum wage was introduced in April 1999 (at £3.60) and is the legal minimum that employers can pay. The aim of the National Minimum Wage is to help increase incomes of the low paid. It has become more important in a labour market characterised by a decline in trade unions and the growth of low-paid service sector jobs. Free market economists, such as Milton Friedman argued a National Minimum Wage would lead to unemployment because firms cannot afford to pay the workers. However, since it was introduced in 1999, the effect on unemployment has been negligible. 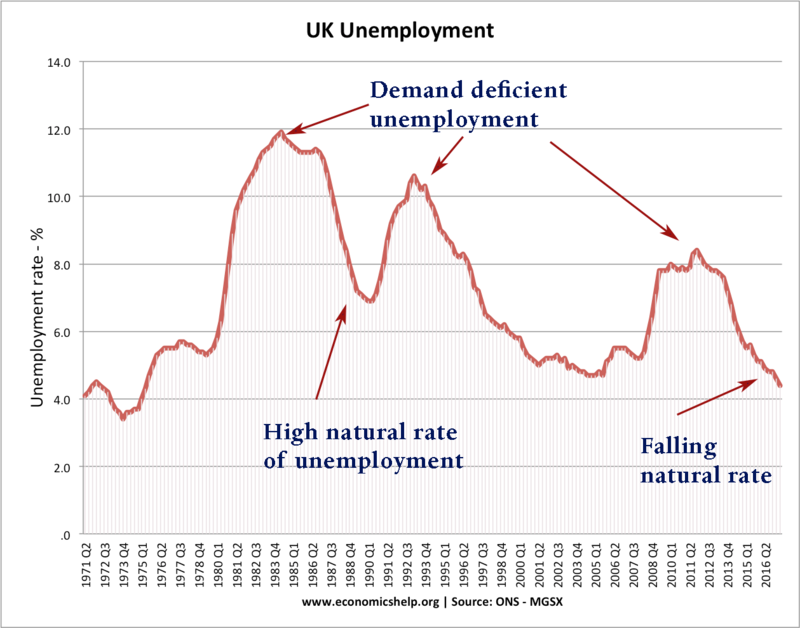 In the UK, there are record levels of employment, lower natural rates of unemployment and unemployment only increasing temporarily because of the recession in 2008. 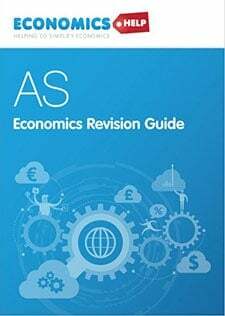 However, although the impact has been less than some economists anticipated, future increases could place a strain on some employers. However others argue that Minimum Wage rates are still too low and do not provide a ‘living wage‘ in certain areas of high housing costs, such as London. It is estimated 1 million workers (5% of the workforce) receive the national minimum wage. By 2020, the National Minimum Wage could reach £9.00 or more. The Resolution Foundation have suggested by 2020 the minimum wage could affect one in nine workers. 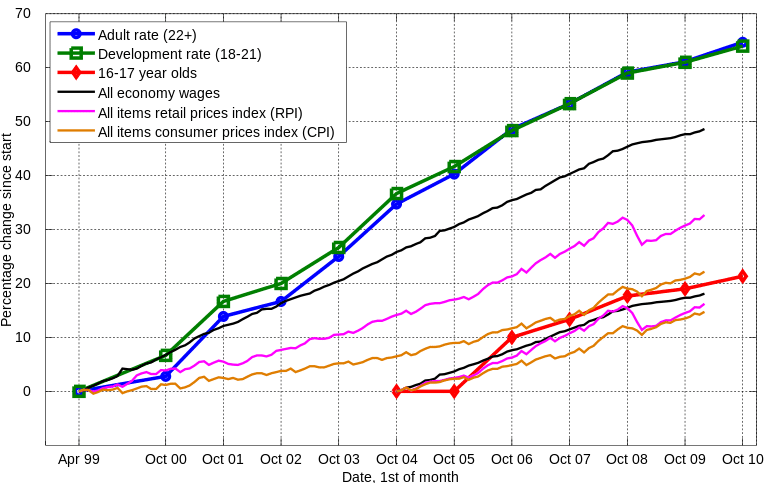 Note: Since October 2010, the National Minimum Wage has increased from £5.93 to £7.20, while average wages have stagnated. Reduces poverty. The minimum wage increases the wages of the lowest paid. These workers will have increased income and will reduce relative poverty. Increases the incentives to accept a job. With a minimum wage, there is a bigger difference between the level of benefits and the income from employment. A minimum wage could also increase the participation rate as the benefits of work become greater and more worthwhile. Increased investment. 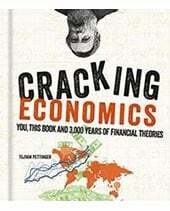 Firms will have an increased incentive to invest and increase labour productivity because labour is more costly. In the long-term, this can encourage greater investment and labour productivity – an economy based on high value added, rather than competing on low wages. Knock on effect of minimum wage. 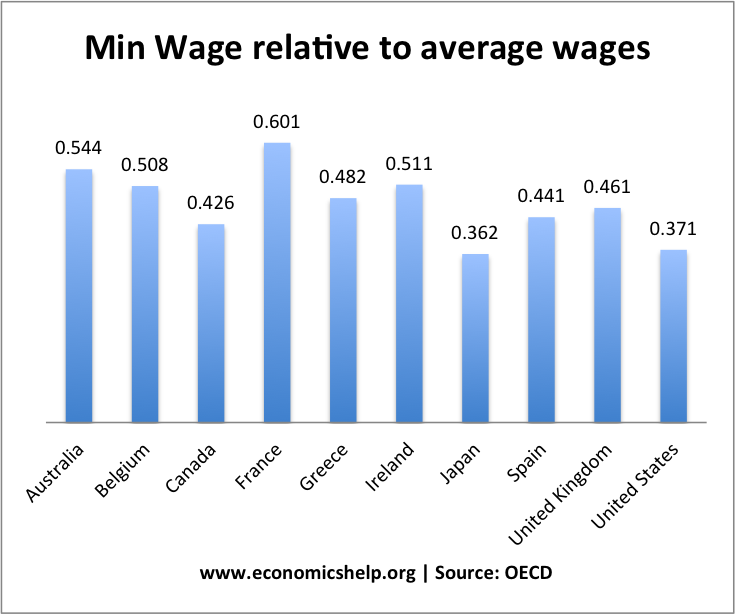 Although only 5-7% of workers are on the minimum wage, the minimum wage has an indirect effect on the wages of those just above the minimum wage. If the minimum wage floor rises, firms may need to increase wages for those just above the minimum wage floor – to maintain pay premium for experienced workers. Counterbalance the effect of monopsony employers. If firms have Monopsony power they can drive wages down by employing fewer workers. However, minimum wages will make this more difficult. 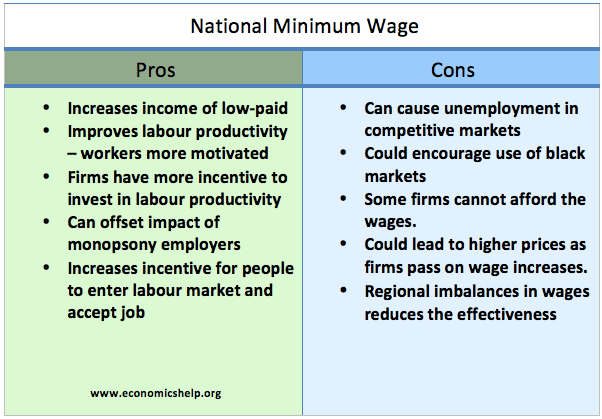 Therefore a minimum wage could have a positive effect on employment. 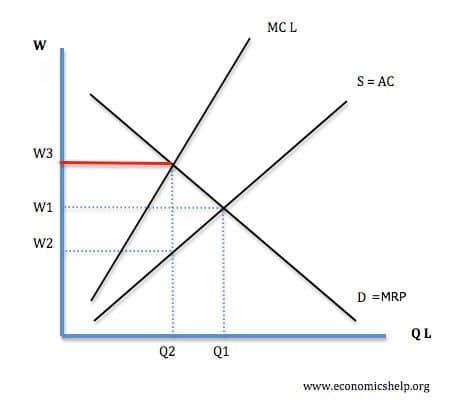 A monopsony pays a wage of W2 and employs Q2. 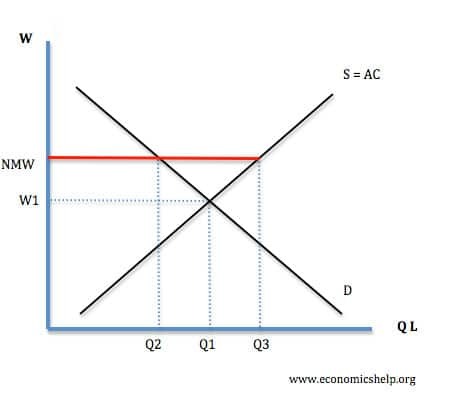 If a minimum wage was placed equal to W1, it would increase employment to Q1. Therefore, in some circumstances, it is feasible that a minimum wage could actually increase employment – or at least not cause any employment. Arguably many firms can afford to pay higher wages, a minimum wage helps redistribute income in society. 2. 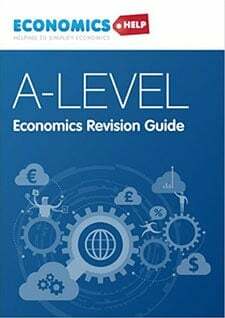 Certain industries vulnerable to a ‘living wage’ It is argued labour intensive industries, where labour costs are a high percentage of overall costs could be hit by a high National Minimum Wage. In particular care workers for old people are often paid the Minimum Wage. With a rise in number of old people needing care, this could significantly increase costs for old age care. 5. More and more workers are getting stuck on the minimum wage More than 1 million workers receive the minimum wage. The highest proportion are amongst women, ethnic minorities and young people. The fear is that a minimum wage encourages firms to keep more workers on the lowest band of wages. 6. Incentive to work black market. A high minimum wage may create an incentive for firms to find ways to avoid declaring wages to government but offer cash-in-hand work in the unofficial/underground economy. This can lead to exploitation of labour and is a concern in some industries – especially with higher rates of migrant labour. What is the best rate to set? State of the economy. 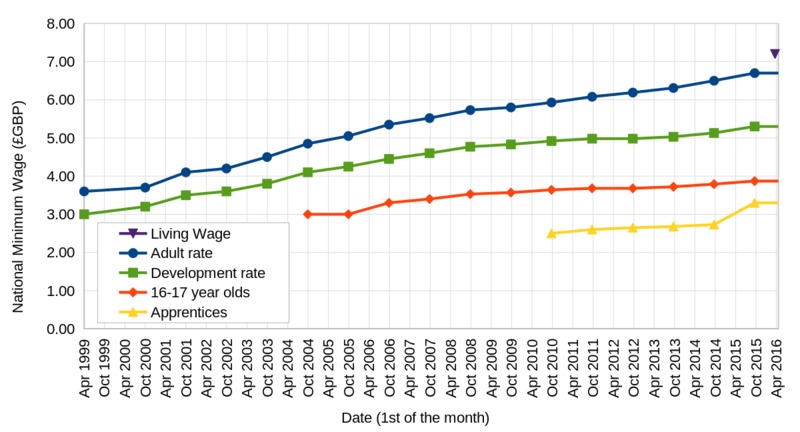 During strong growth and falling unemployment, it is easier for firms to pay higher wages. The elasticity of demand. Is demand for labour wage inelastic? 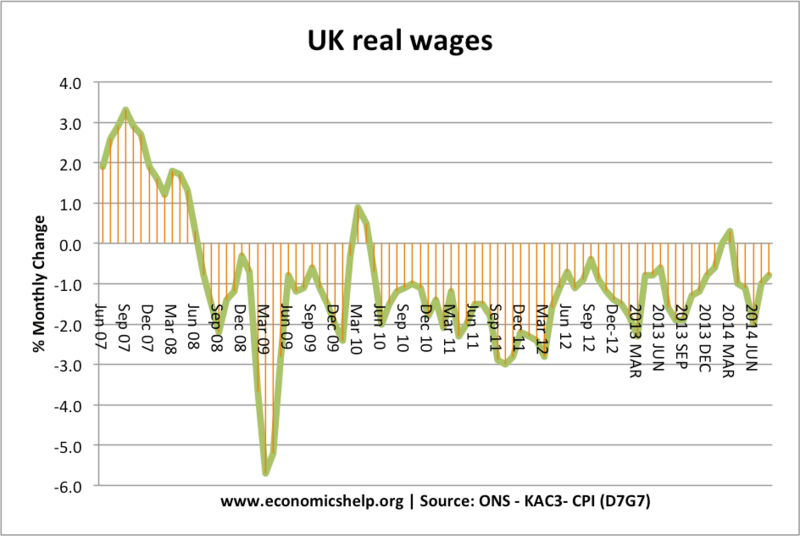 or will some firms be very sensitive to higher wages? Some service sector jobs like hairdressers/cleaners may argue a small increase in their wage bill could lead to unemployment. Type of labour market. 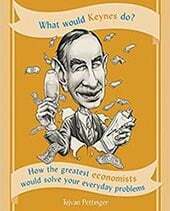 Are labour markets competitive or monopsonistic? 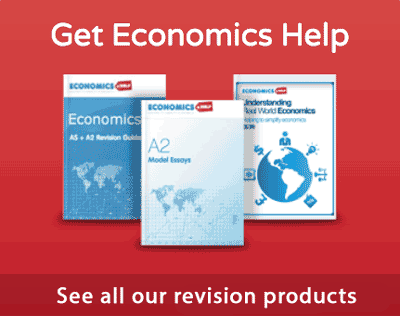 Is there scope for firms to increase labour productivity? and therefore be able to afford the wage increases. 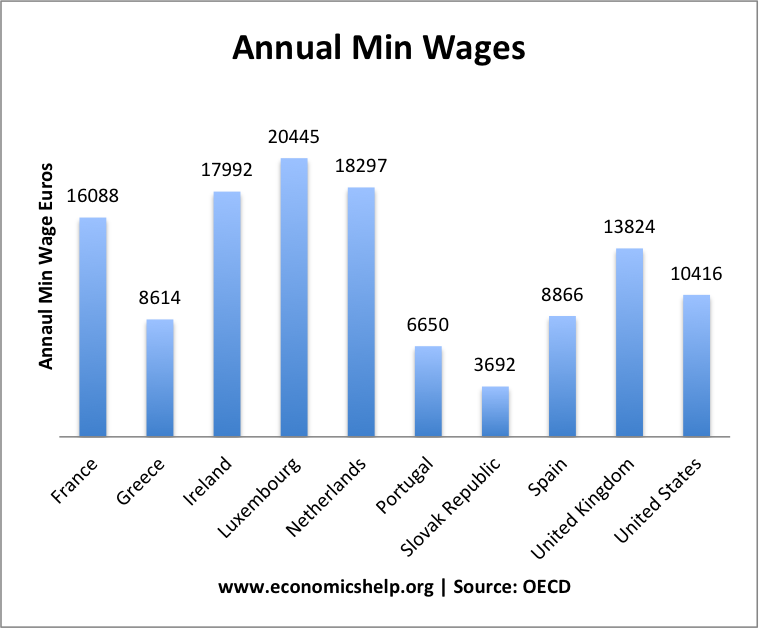 Most Western economies adopt a legal minimum wage. Does A Minimum Wage – Does it reduce poverty?